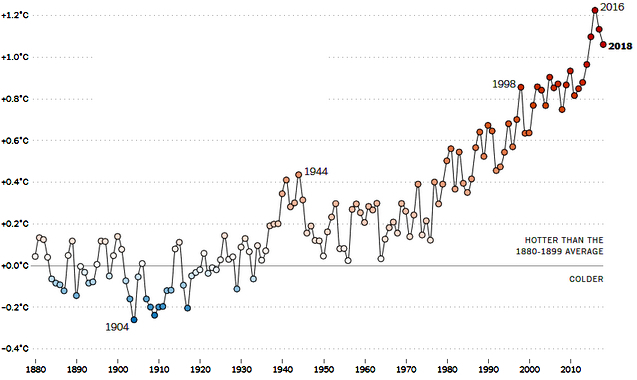 The quickly rising temperatures over the past two decades cap a much longer warming trend documented by researchers and correspond with the scientific consensus that climate change is caused by human activity. The results of this rapid warming can be seen from the heat waves in Australia and extended droughts to coastal flooding in the United States, in disappearing Arctic ice and shrinking glaciers. Scientists have linked climate change to more destructive hurricanes like Michael and Florence last year, and have found links to such phenomena as the polar vortex, which last week delivered bone-chilling blasts to the American Midwest and Northeast. The Earth’s temperature in 2018 was more than one degree Celsius, or 1.8 degrees Fahrenheit, above the average temperature of the late 19th century, when humans started pumping large amounts of carbon dioxide into the atmosphere. Scientists say that if the world is to avoid the worst consequences of climate change, global temperatures must not rise by more than two degrees Celsius compared with pre-industrial levels. 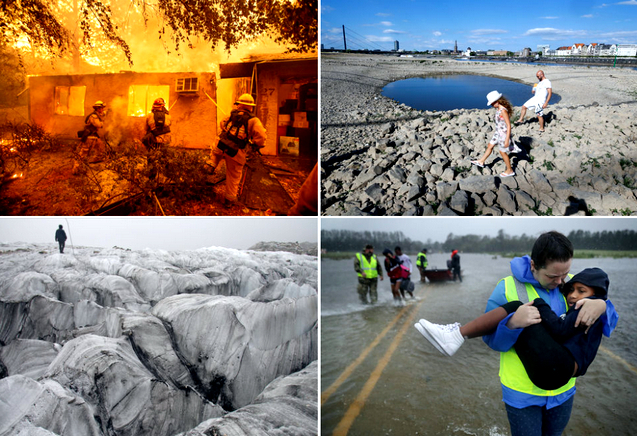 Clockwise from top left: A wildfire in Paradise, Calif., in November; a dry part of the Rhine in Düsseldorf, Germany, in July; James City, N.C., during Hurricane Florence in September; and a melting glacier in Yunnan Province, China, in September. The warmest year was 2016, its record-setting temperature amplified by the Pacific Ocean phenomenon known as El Niño. In 2018, the world experienced the opposite phenomenon, a cooling La Niña, with a weak El Niño toward the end of the year. The effects of the El Niño late last year are likely to be felt in 2019, said Zeke Hausfather, an analyst with Berkeley Earth, an independent climate research group. He said that 2019 would probably be the second warmest year on record. Last month, Mr. Hausfather issued figures correctly ranking 2018 as the fourth warmest. 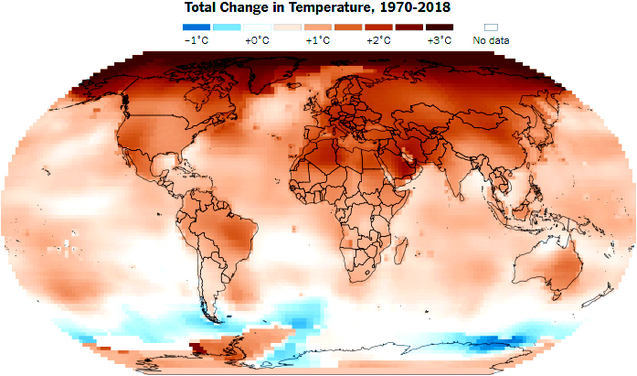 The publication of the NASA temperature data came in tandem with a similar announcement from the National Oceanic and Atmospheric Administration, which uses a slightly different methodology to determine overall changes in the planet’s temperature but also ranked 2018 as the fourth warmest year. The two federal agencies, while broadly consistent, have disagreed on the relative rankings for some years; NASA called 2017 the second warmest year, while NOAA said it was the third, after 2016 and 2015. In related research, two new studies published Wednesday in the journal Nature suggested that melting polar ice caps could lead to even more extreme weather. One study, led by Tamsin L. Edwards, a climate scientist at King’s College London, focused on the impact of Antarctic ice-shelf collapse. It estimated that sea level rise caused by melting in Antarctica would be close to 10 inches, much lower than a 2016 study based on much of the same data that forecast a rise of five or six feet by 2100. But even this lower estimate for sea level rise would be enough to trigger an increase in extreme weather events, according to a companion study led by Nicholas Golledge, an associate professor at the Victoria University of Wellington’s Antarctic Research Centre in New Zealand. For example, Dr. Golledge said, an influx of fresh water from Greenland could slow the circulation of the Atlantic Ocean, which, among other things, would lead to warmer waters in the Gulf of Mexico and, subsequently, more hurricanes. In addition to the fourth warmest year on record, 2018 was also the fourth-costliest for weather disasters in the United States. Last year’s total was $91 billion, less than 2017, when disasters inflicted a record breaking $306 billion of damage. But it reflects a broader trend of more frequent and intense extreme weather events including hurricanes, floods, droughts and wildfires that scientists say are to be expected with a warming climate. According to NOAA, 2018 was the first time on record when wildfires have exceeded average hurricane costs in the United States. The annual global temperature ranking is usually announced in mid-January, but it was delayed when the government shutdown prevented federal scientists from completing the analysis.